“From our porch we can see down to the river, where we have our own little private beach and swimming hole,” says Albuquerque native Bob Caragol of his and his wife Irma’s new home. 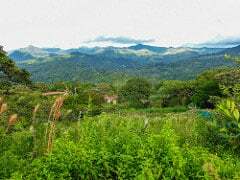 Their story is typical of expats living in the scenic mountain town of Santa Fe, located in Veraguas province in west-central Panama. The 4,000 or so residents of Santa Fe enjoy a year-round spring climate and an abundance of nature. Here you can live a healthy retirement fueled by fresh produce and plentiful clean air. And you can do it for pennies on the dollar, too. All told, a couple can comfortably live here for $1,500 a month, including rent. If you’re after a low-cost, rustic retreat and country lifestyle, Santa Fe may be the place for you. Panama’s highlands are known for their comfortable climate, called “eternal springtime” by some. And Santa Fe and its environs are no exception. Sitting at around 1,500 feet, Santa Fe’s year-round daytime temperatures typically range from 75 F to 85 F, and at night temperatures cool down to 65 F to 70 F. The area gets plenty of rainfall, ranging from afternoon downpours to soft showers called bajareque. Misty fog collects in the lower valleys or shrouds the higher peaks until the bright morning sun burns it off. Much of the land is protected as part of the Santa Fe National Park, which surrounds the town on three sides. You can spend your days hiking, bird-watching, horseback riding, or river tubing. Orchids are native to the area and grow both in the wild and in cultivation. Local guides offer night-time hiking tours to the summit of Cerro Tute to see the resident animals, like tapirs and capuchin monkeys, when they are most active. You can trek to numerous rushing waterfalls at Alto de Piedra, Bermejo, and the triple falls atop El Salto. Or you can simply relax on your porch and watch the butterflies and hummingbirds flit by. 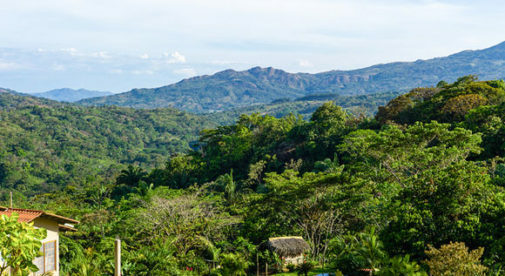 You’ll enjoy springtime weather in Santa Fe, Panama year-round as daytime temperatures typically range from 75 F to 85 F.
But for many expats, the best thing about Santa Fe is the low cost of living. “A couple can manage on as little as $750 a month here, if they own their home,” says expat Carl Conway. Living in and around Santa Fe, your groceries and regular household items will run $400 to $500 a month for a couple, and you may spend $120 or more in a month for entertainment and going out to eat frequently. Most expats own a vehicle for convenience, and transportation expenses average $50 to $150 a month, including trips to Santiago (the provincial capital) as needed. A trickle of foreigners started coming to Santa Fe in the 1990s, and slowly an expat community developed that numbers in the dozens today. Arriving primarily from Canada, the U.S., Europe, and South America, they form a loose-knit yet cohesive group, helping each other when needed and supporting each other’s endeavors.